- a web page containing only the text of the walk description. You can save a route description (in either HTML or PDf format) on a smartphone or tablet, in order to study the description and map later on, when following a walk on the ground. Or you can print the description in PDF format, on a sheet of paper. These options should be sufficient to follow a route on the ground. 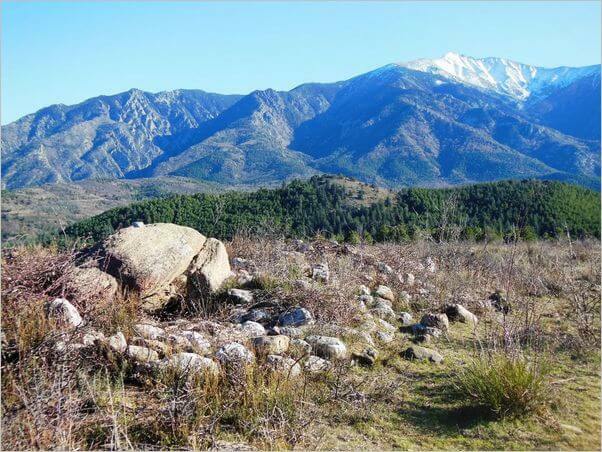 However, you are strongly advised also to take with you the 1:25,000 scale IGN "carte de randonnée" map for the area covered by the walk (that is, for walks close to Vernet and to the Pic du Canigou, the IGN map 2349ET, "Massif du Canigou"). You can translate the text of a walk description (into, for example, German, Catalan or Spanish) with "Google Translate". A "plug-in" to facilitate such a translation appears at the top of several pages of this site. The pages which contain only the text of a walk description are provided so that, if you wish, you can translate that text online, then print out that translation and take it with you on a walk (along with, for example, a printout of the walk map in pdf format). The text of the walk descriptions has been written in a way that is intended to minimise translation errors. This is not a well-known walk, but the paths and and tracks which it follows are clear and easy to find. It mostly follows the route of trail number 7, in a network of local mountain-bike riding circuits.